Laura L. S. Bauer is a PhD candidate in the English department of Claremont Graduate University and film studies editor for Women's Studies: An Interdisciplinary Journal, a peer-reviewed scholarly journal published by Taylor & Francis. Laura L. S. Bauer, Editor. Hollywood Heroines: The Most Influential Women in Film History. Greenwood, 2018. ABC-CLIO, publisher.abc-clio.com/9781440836497. 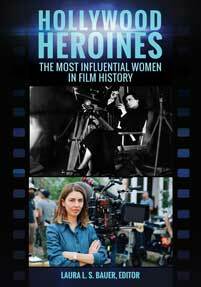 This is a topical resource that provides a comprehensive look at the most influential women in Hollywood cinema across a wide-range of occupations rarely found together in a single volume.